Posted on October 23, 2018 at 10:44 pm. 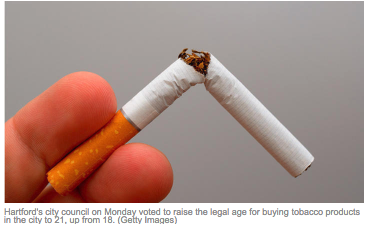 WASHINGTON, D.C. – The Hartford City Council took bold action last night to protect kids from tobacco addiction and save lives by voting to raise the sale age of tobacco products in the city to 21. As the first city in Connecticut to raise the tobacco age to 21, Hartford is providing strong leadership in the fight against tobacco – the No. 1 preventable cause of death – and setting a terrific example for Connecticut and the nation. 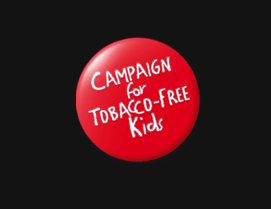 Increasing the tobacco age to 21 will help prevent young people from using tobacco, save lives and help make the next generation tobacco-free. The Hartford vote adds momentum to the growing movement across the nation to raise the tobacco age to 21. Six states – California, New Jersey, Massachusetts, Oregon, Hawaii and Maine – have enacted Tobacco 21 laws, along with at least 350 localities, including New York City, Chicago, San Antonio, Boston, Cleveland, Minneapolis, both Kansas Cities and Washington, D.C. Many other states, counties and cities are considering such measures. Posted on October 23, 2018 at 3:43 pm. Posted on October 23, 2018 at 3:26 pm. In April 2017, Harbinger investigated a new type of electronic cigarette, the Juul, being found in the hands of a few students around the school. At this point in time, only 13 percent of East students could be found owning the device. 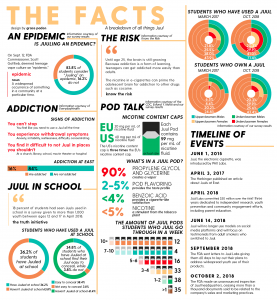 But now, as the FDA has announced the usage of Juuls among minors as being an “epidemic,” 31 percent of students at East own a Juul of their own, going through an average of 2-3 pods a week. In April of 2017, Haney confiscated the first Juul at East ever. Now, Haney confiscates one a day — with each catch coming with a two to three-day suspension. In a press release issued Sept. 12, the FDA labelled Juuling as an epidemic, which is no mistake according to attorney Esfand Y. Nafisi, who is leading a class action lawsuit against Juul. In the recent Harbinger poll of 345 students, 83.7 percent of them consider Juuling to be an epidemic. According to the Center for Disease Control and Prevention, cigarette smoking declined among teens and middle schoolers from 2011 to 2017. Then Juul happened. According to a Jan. 9, 2018 report from the Campaign for Tobacco free kids, there were over 2.1 million youth e-cigarette users. Now, the teenage generation has been labelled Juul’s Guinea Pig Generation by the Public Health Law Center — and the long-term health effects are unknown. The long term effects of vaping are unknown — but the long term effects of nicotine aren’t. And one Juul pod, a replaceable cartridge filled with nicotine and flavorings, contains the same amount as an entire pack of cigarettes. According to Dr. Nikki Nollen from the Department of Preventive Medicine at KU Medical Center, nicotine rewires the brain. Exposure to nicotine can damage brain development by disrupting and altering the growth and structure of the circuitry part of the brain that controls attention, learning and susceptibility to addiction, according to the Public Health Law Center. Nicotine also affects the heart rate and blood pressure. According to Pulmonary & Critical Care medicine doctor Scott Rawson, who works at Overland Park Regional Medical Center, there is no clear end point when Juuling — people will just Juul through a two hour movie and go through pods without considering nicotine intake. Opposed to the clear end point in cigarettes — there is an understanding of how many cigarettes have been smoked. Besides the effects of nicotine, he has also discovered “popcorn lung,” a type of pneumonia that causes intense inflammation that destroys lung tissue. He has been more frequently treating popcorn lung in teens, which is believed to be caused by the flavoring in Juuls and electronic cigarettes. 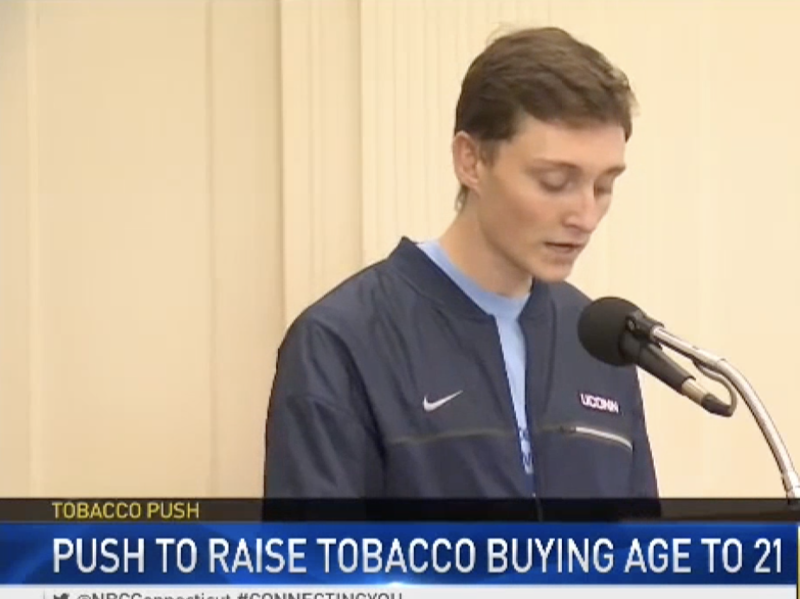 Rawson thinks we won’t be able to see the long term consequences of Juuling for another 15 to 20 years. The vast majority of his patients have stopped tobacco smoking, but he now fears for how much his patients are vaping in place of the cigarettes. Posted on October 18, 2018 at 2:09 pm. 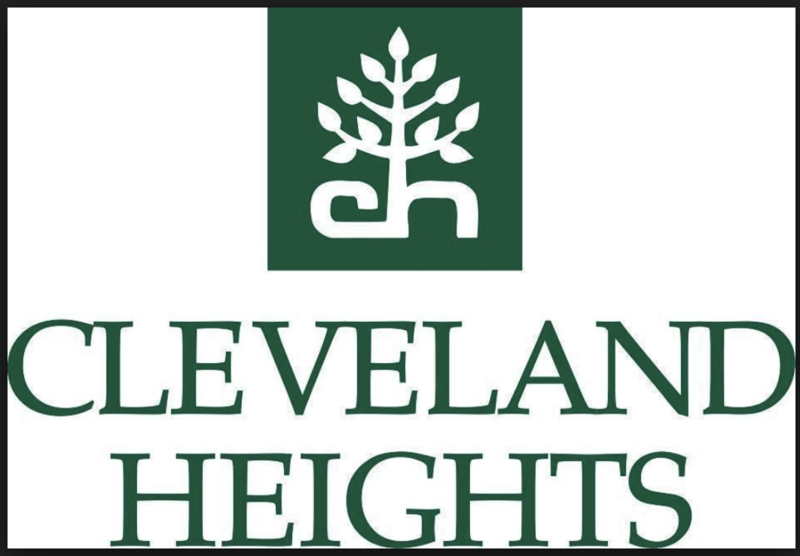 CLEVELAND HEIGHTS, Ohio — In voting to raise the minimum age for purchasing tobacco products, “e-cigs” and “vapes” from 18 to 21, City Council received personal thanks on Monday from Cuyahoga County Health Commissioner Terry Allan. Allan and his department will be handling enforcement of the new “Tobacco 21” law in Cleveland Heights, which takes effect on Jan. 1 and involves civil penalties for underage sales by vendors, as well as possible permit revocations for multiple offenses. Posted on October 17, 2018 at 2:15 pm. You have to be 21 years old to legally drink, but how about 21 to smoke? Community leaders are hoping Hartford will become one of the first cities to raise the smoking age. Some doctors and lawmakers are all for it, but Hartford business owners are not happy. “We’re seeing more and more vaping,” said Dr. Seth Lapuk, of Connecticut Children’s Medical Center. He says Hartford should raise the legal age for the sale and distribution of tobacco from 18 to 21. “There is strong evidence that you do not start smoking by 18 years old, there is a 90 plus percent chance that you will never start smoking,” he said. Hartford would be the first city in Connecticut to go above the current state law requiring people to be at least 18. “It’s designed to make everyone stop smoking, but they should do the whole state, not just the city of Hartford,” he said. Rayyshi thinks the proposed change is unfair to him. “We’ll lose more business. People just go out of the city to buy it,” he said. Hartford City Council member Dr. Larry Deutsch says it’s a matter of public health. “I understand it’s a shame in a sense. On the other hand, if they want to sell to those who are over 21, this would not stop them from doing that,” he said. He says something needs to be done to combat the e-cigarette and vaping epidemic. “It’s targeted to young people, especially minorities and Hartford is primarily Latino and African-American, and targeting them and making them sicker,” he added. Cities and towns in other states have passed similar laws. Deutsch says the hope is if Hartford does it, the state will follow.